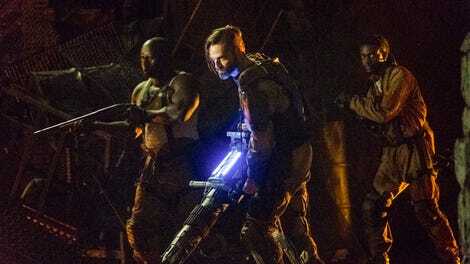 The 100 has spent the first few episodes of this season keeping many of the main characters separated. Rather than immediately bringing the crew on the Ark back to earth and opening up the bunker so that Octavia and everyone else might escape, the show found a way to tell a few different stories about life in the six years after Praimfaya. It’s a bold choice that paid off, giving us meaningful character work after the reset button that was last season’s finale. The payoff continues in “Pandora’s Box,” as many of the characters are reunited once again, their years spent isolated from one another finally over. It’s what they’ve been looking forward to ever since Praimfaya, and yet, it feels bittersweet. “Pandora’s Box” likely wouldn’t be as effective had The 100 pulled the characters together sooner. It would have been simple enough to have the Eligius crew move quickly from Clarke to Bellamy to the bunker, building to an inevitable conflict, but the restrained, patient storytelling allows this episode, and the clashes within, to pack more of a punch. This is an emotional episode for a number of reasons: there’s the devastating separation of Kane and Abby, a handful of teary-eyed reunions, and Murphy still doing is best to be a better person, even as certain death stares him and Raven in the face. Those moments land because of the time we’ve spent getting to know what these characters were up to in the aftermath of, yet again, the end of the world. It’d be expected, then, that “Pandora’s Box” is a hopeful episode. After all, Bellamy finally gets to see Clarke and Octavia again, Abby is reunited with the daughter she feared was dead, and Kane manages to secure his freedom after coming close to death in the fighting pits of the bunker. But there’s no real joy here, and the slow, eroding confidence of the characters is the episode’s greatest strength. “Pandora’s Box” doesn’t pull back from the complicated fact that these people aren’t the same after six years separated from each other. They’ve changed in ways that are perhaps irreversible. They all have a new understanding of survival and violence, so many of them having given up hope of ever seeing each other again. There’s a staggering moment, about halfway through the episode, that embodies this idea of daunting change. 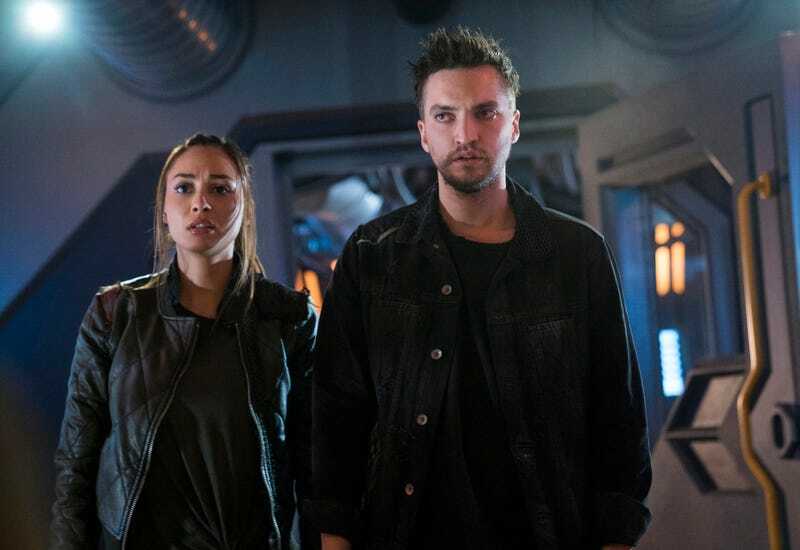 Once Bellamy has negotiated a deal with Charmaine, where he doesn’t kill her men on board Eligius in exchange for help getting into the bunker, the rescue missions begins. It happens just as Octavia seems poised to kill Kane for his protest against her particular brand of justice, rubble falling from the sky and stopping everyone in their tracks. Bellamy descends into the bunker, followed by Clarke, and it’s a surreal moment. It’s also a powerful one. For just a second we see flashes of the old Octavia, the one certainly hardened by their struggles on the ground, and yet not yet as cynical and controlling as she’s become as the Red Queen of the bunker. She embraces Bellamy, a moment shocking in its tenderness. Then the evacuation begins, as the Eligius crew brings the 814 survivors from the bunker up to the ground, two at a time. As they emerge they squint at the sunlight, the first they’ve seen in six years. Octavia stands atop the rubble and the camera pulls back, revealing more and more of the ruined landscape. It’s an apt visual metaphor for the way Octavia, and this world, has changed. Down below she was the queen. Up above, she will need to adapt again, the expanse around her suddenly filled with threats both known and unknown. Everything is shifting. After everyone seemingly accepted their fate, there’s suddenly a shred of hope in reconnecting with old friends. When Kane makes his stand against Octavia’s senseless violence in the pits, he says that “we have a chance to do something better here, and we’re throwing it away. Strength is nothing without mercy.” He knows they’ve been given an opportunity to move forward as one crew, and yet he sees the same divisions, the same mistakes being repeated. Octavia might know that too. Her emergence into the sunlight of earth comes as a shock to her, and you get the sense that she’s ruminating on what she’s done, on what her life had become in the bunker. For all the reunions and smiles and hugs, this is an incredibly melancholic episode. In typical The 100 fashion, hope is offered up before being torn away. Now, war is on the way yet again, and everybody seems to have forgotten what it’s like to really live. Abby tells Kane that they did what they had to do in order to survive. “How many times can we tell ourselves that?” he asks in return. When hope was ripped away, everyone just tried to survive. But now they may not be able to reckon with what they did and build something new. Something tells me that even though she has Clarke back, Abby is a long way from being done with her struggles and addiction. Raven and Murphy playing soccer was too much to handle. Their unencumbered joy just so rare these days. So, what are our theories when it comes to the mysterious Eligius III? “Now, we go to war.” A line that could end so many episodes of this show.